Lying in the temperate valley of the river Ping, some 700 km North of Bangkok, Chiang Mai -- city and province -- is full of cultural, natural and architectural interest, and also provides the perfect base for exploring Thailand's northernmost provinces. The name 'Chiang Mai' means New Walled City. While they can no longer make any claim to newness, the ancient city walls still stand, for the most part, surrounding the center of the city. Inside are many ancient temples (the entire city has over 300). To the West of the old city, towards the river, lies the main commercial district, and the renowned Night Bazaar, a perfect place to pick up gifts for friends and family. Situated towards the summit of the heavily forested Suthep Mountain, which overlooks Chiang Mai, Wat Phra That Doi Suthep is the province's most sacred temple. 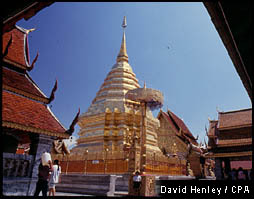 The awe-inspiring gold chedi is said to house a sacred relic of the Lord Buddha, enshrined there in 1284 AD by King Kue Na. The trip up the mountain also affords splendid views over the city and valley. Beyond the temple lie a royal palace and a tribal village. The city's most important ceremonial temple houses one of Northern Thailand's most revered Buddha images, noted for its rain-bringing powers which keep the area fertile. Also in the grounds is an exquisite wooden scripture library. 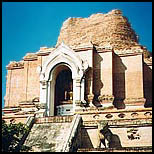 Situated in the centre of the old walled city, this temple is famous for its massive ruined chedi. Originally dating back to 1401, the chedi was enlarged in 1545 to reach a height of 84 metres. Unfortunately it was partially toppled by an earthquake in the 16th century, but what remains is extremely impressive in scale and beauty. In the grounds of the same compound is the lak muang, or city pillar, where offerings are made to the city's guardian spirit. Chiang Mai's Night Bazaar has gained an international reputation as a one-of-its-kind shopping area. The whole range of local and tribal goods are available, from silk shirts to wood carvings, silver jewelery to antiques, and all at unbeat able prices -- though bargaining is essential if you are to get the best deal. What better way to end a day in this beautiful city than with a Khan Toke Dinner, a northern style banquet. Diners sit around a low table, the 'khan toke', sharing northern delicacies, and watching the evenings entertainment of dancing and music unfold. For the full itinerary and price, take a look here. This website copyright Chiang Mai In Action Tour and Travel Services © 2000-2008.